We know that creating the perfect smile takes the artistry of a caring, capable doctor. 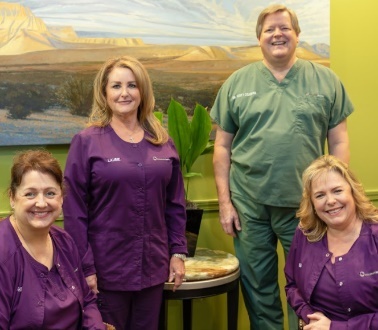 At Coleman Dental, our state-of-the-art laser dental equipment is so precise that we can easily take care of many dental problems quickly and comfortably. Whether you need freehand bonding to fix minor imperfections or traditional and no-prep veneers, we can give you the smile of your dreams. We start with a detailed analysis to help you make the most informed dental health choices possible. Our laser-scans can locate any decay or weak spots before they cause a serious problem. We also use digital X-rays, giving patients an immediate view of their teeth to illustrate potential problems. Using the latest digital technology dramatically reduces your exposure to radiation. Plus, there’s no film processing or waiting. And our special cameras and monitors allow both you and Dr. Coleman to see a complete picture of what’s being addressed. Coleman Dental is also one of just a handful of offices in the world with its own in-house dental ceramic laboratory. That means we can build custom veneers — both traditional prep or no-prep — within 24 hours, rather than having patients wait weeks. And the no-prep veneers are actually reversible. Ask the Coleman Dental staff for details. If you are considering dental implants, Dr. Coleman believes that a 3-D CT scan is imperative in the diagnostic phase. We use the highly sophisticated Galileos 3-D CT scanning machine which delivers a complete picture of the entire jaw. This piece of equipment is invaluable when planning the exact placement and positioning of a dental implant and shows Dr. Coleman the jaw joints, nerves and blood vessels, as well as all important anatomical structures.